I was chatting with a friend this morning and kind of whining about how cold it was outside (upper 20's) and how boring the winter is here in Connecticut. We won't have any fresh greens, fruit, or mushrooms for months I lamented. She was kind enough to point out there is no snow on the ground and we could still go outside for a short walk and maybe find some rosehips or other hearty wild foods. Great idea, thanks Stephanie. 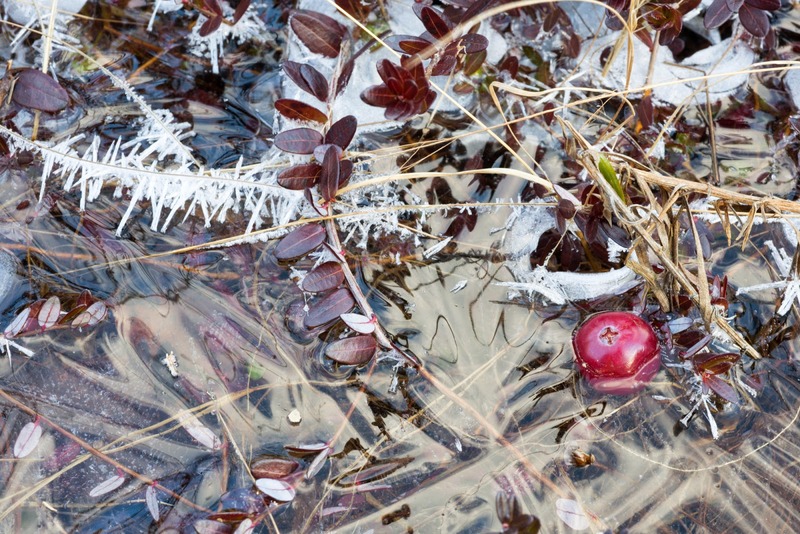 We bundled up and put on multiple layers before heading out to the cranberry bog for a peek. It has only been cold for a few days, but the rain that fell last week in the field had frozen into sheets of ice, making it lots of fun to slip around. 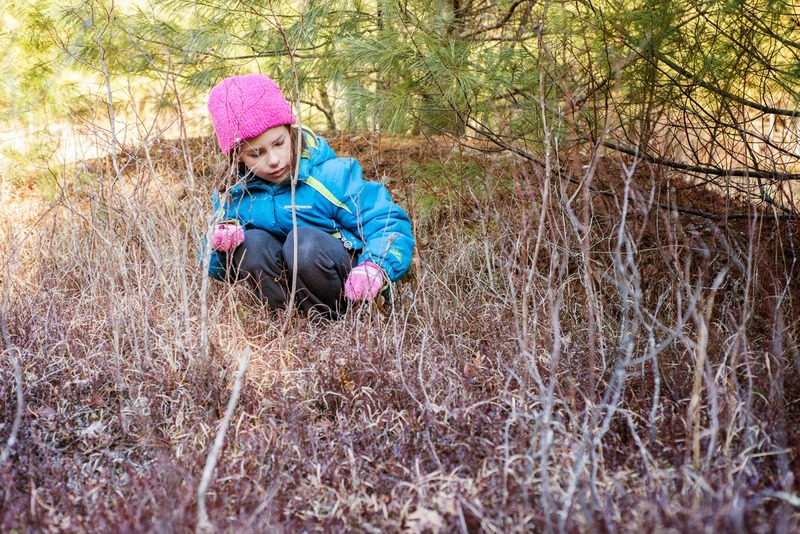 There are still plenty of cranberries (Vaccinium macrocarpon) left in the field, and we snacked on some while picking a small container of berries to bring home. 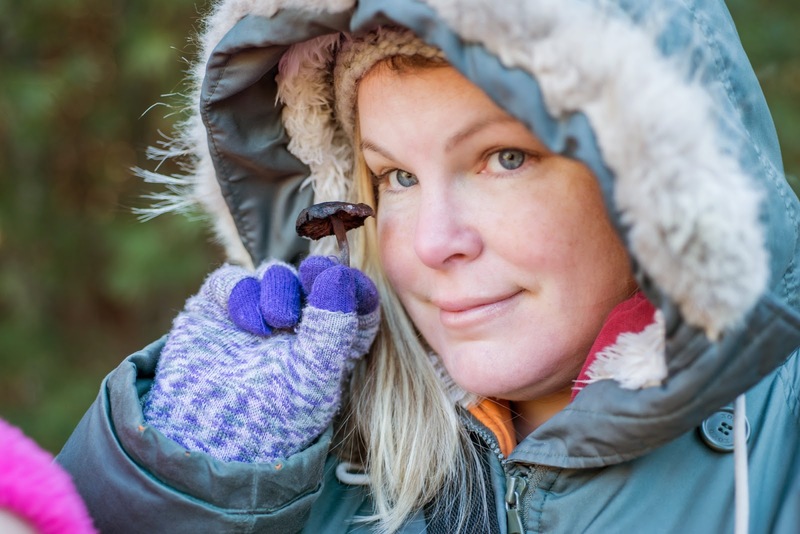 Gillian had the most fun, finding the ice crystals that formed on the grasses stunning, and the air pockets under the ice cool to break open while popping frozen cranberries into her mouth. The cold mellowed out the tartness quite a bit, and they were softened by being frozen. Robert made a ginger-cranberry syrup with the soft berries, and I cooked the rest up into a traditional cranberry sauce to eat with pancakes for breakfast. 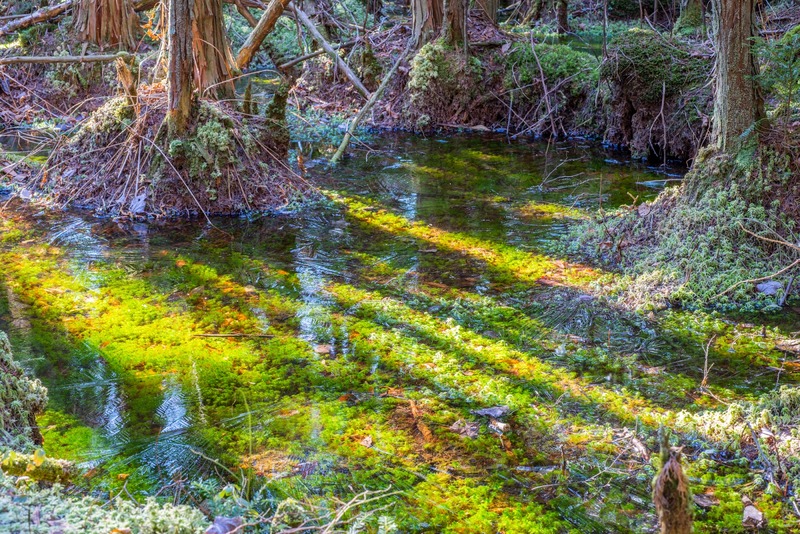 Moving on down the path through the surrounding bog, we marveled at the frozen pools of water and the sphagnum moss trapped under the ice in pristine condition. The sun was shining and reflecting off the sheets of ice, and it looked slightly unreal. Further into the forest, we encountered plenty of pines and mixed spruce trees mixed in with oaks and birches. 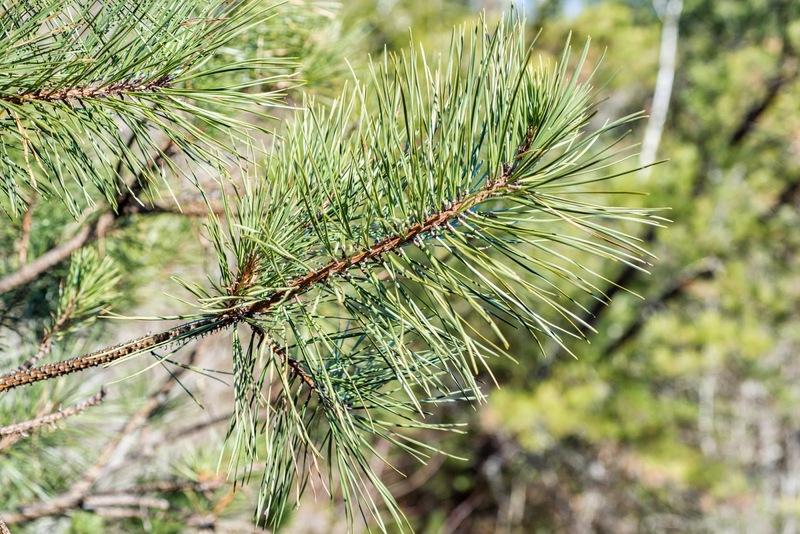 The needles of the white pine (Pinus strobus) can be made into a bracing, pine-scented tisane that contains vitamin C and tastes really good mixed with plenty of honey. 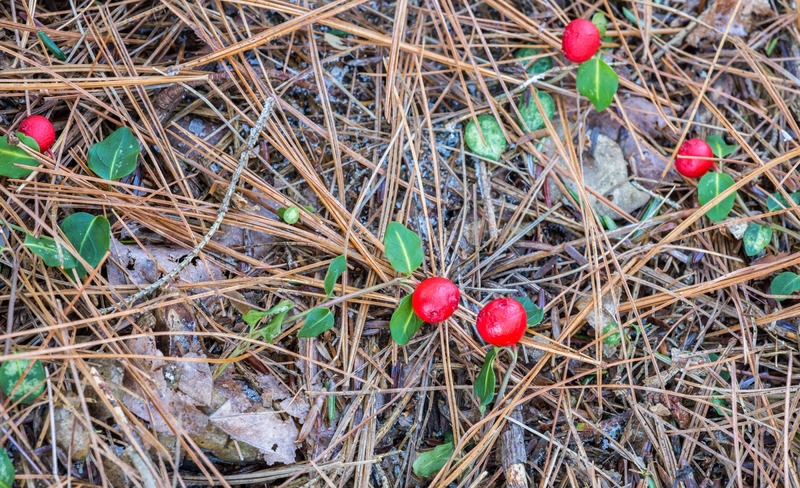 Pine forests are preferred habitats for two more hearty plants to forage in winter, wintergreen (Gaultheria procumbens) and partridgeberries (Mitchella repens). Both of the evergreen plants had their edible berries present. 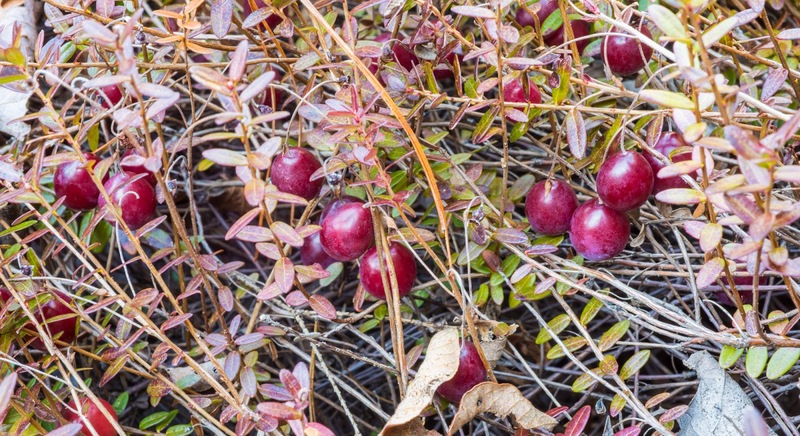 While the partridgeberries growing from the non-edible, prostrate foliage are mostly tasteless, we picked a few to add color to a rice and grain salad for lunch. 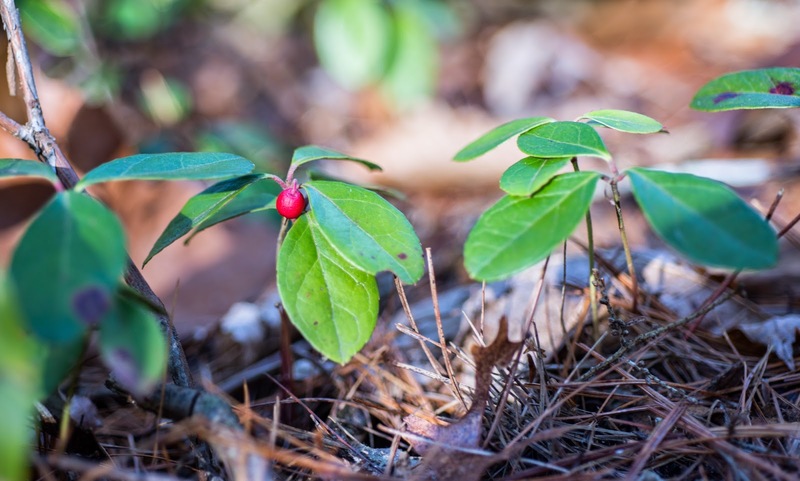 The leathery leaves and red, crowned berries of wintergreen both have the minty, wintergreen flavor, and we plucked some of both to make into a refreshing, warm tisane. As for the fungi, we spotted the usual suspects on dead wood, crusts and polypore shelves. These mushroooms are just doing their job of breaking down the wood and decomposing the dead wood into sawdust and back into soil. Last week we came across some stunning blue turkey tails (Trametes versicolor) on another walk. Turkey tails come in many color combinations from oranges, browns, tans, greys, and sometimes subtle shades of blues. I was very surprised to find one poor, frozen, blackened-with-age gilled mushroom. I am not sure what it was, but it was my last fungi find for the year of 2014.